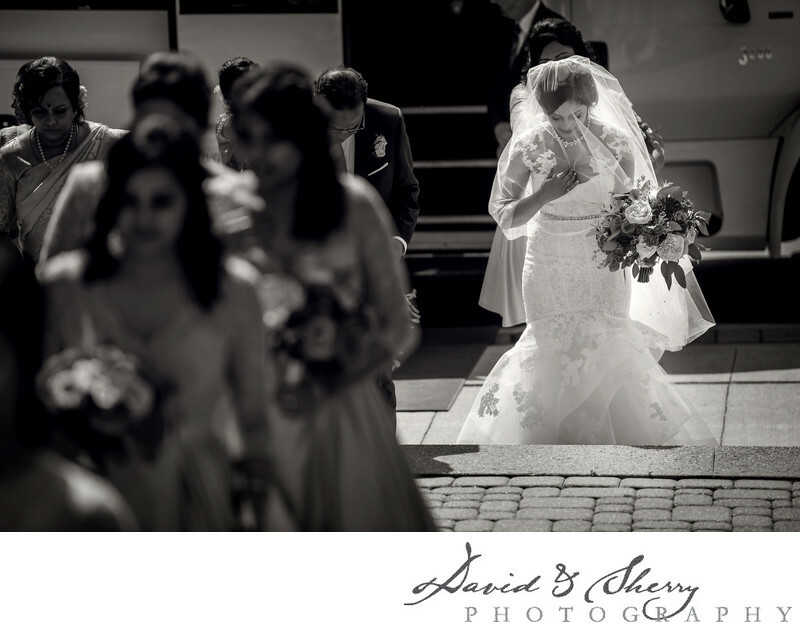 Canada's largest city and perhaps it's most diverse offers so many options for capturing beautiful wedding photography. Every different kind of look or option is presented before you with regards to the photos at weddings. You can choose the opulence of the Trump Hotel or the Carlu or Ritz Carlton to the nature feel of the Evergreen Brickworks, or the waterfront of the Humber Bridge and Palais Royale. You can find yourself in a large open park area such as High Park, or walking the streets of downtown looking for beautiful architectural backgrounds. If you want a historic and beautiful spot to take photos you can look at Casa Loma or Graydon Hall Manor. All of these are open to you as choices of where to take the formal photos at your wedding. From the beautiful portraits of the bride and groom to the bridal party, bridesmaids, groomsmen and family. The photo before you was taken at one of Toronto's beautiful churches just as the bride exits her limo on her way to the ceremony to meet her groom down the aisle. It was a beautiful moment and one that is so meaningful to her. We have the best job in the world.